Also referred to as ENTJ, ESTJ, ExTJ, ETJ, or Extroverted Thinking personality. Capable, decisive and organized, your Extraverted Thinker (ETJ) will most likely be at the pinnacle of business as an adult. ESTJ and ENTJ children like to be in control and enjoys situations that challenge and stimulate them within the context of interacting with a variety of people. Ambitious by nature, this type of child thrives on competition and public accolades. The extraverted thinking child believes that behavior should be logical and probably finds listening to another person’s perspective to be challenging. 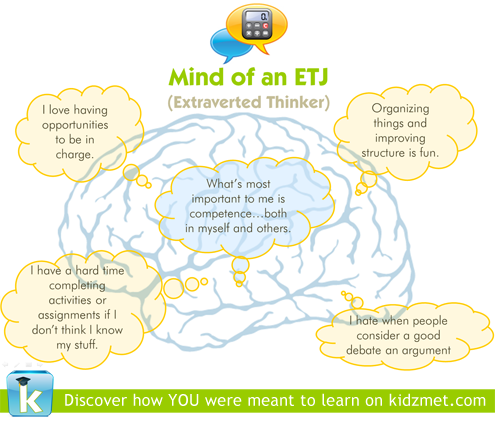 People probably often guess that extraverted thinking kids are older than their chronological ages. Ambitious by nature, the Extraverted Thinker (ETJ) thrives on competition and public accolades. It’s important to get this child into groups that help them channel their abundant energy so that they don’t let it escalate into overaggression. This child has a gift for the analytical and relishes problem solving and likes to find flaws in ideas or plans. Use this innate talent to help your extraverted thinking child edit initial homework drafts and understand how he ro she can make not just this, but future assignments even better. A natural debater, an extraverted thinker has a natural gift for justifying answers and defending positions. As such, if your ESTJ or ENTJ child earns a low score or grade, be sure to ask the teacher to be specific with critiques so that you can help him overcome issues in the future. The consummate planner, an extroverted thinker may become anxious or distressed when juggling multiple long-term assignments. If he is given a single deadline for an assignment, work with your extroverted thinking child to develop interim steps and deadlines so that he or she can play to the ETJs strength of approaching multiple assignments like an endurance runner instead of a sprinter. Encourage your child to complete homework as early as possible, so that he or she doesn’t encounter undue stress related to bedtime, favorite show coming on, etc. In this same vein, be sure to let this student know when time is almost up for completing an activity (e.g. 5 minute warning). This student likes to adhere to boundaries and rules and may label you “unfair” if homework rules are not enforced equally for all siblings in the family. This student learns well from study groups, as verbalizing thoughts helps this student think through problems. Ensure this student is in a quiet part of the house when working through a particularly difficult assignment, as other noises and conversations can be extremely distracting. Encourage this child to accept both success and defeat with grace. Help your child develop an appreciation of other’s merits—not simply focus what needs to be corrected. Help your child develop completion plans for long-term assignments and, should something come up that interferes with the original plan, help them to develop an alternate one. Introducing this student to tools like OpenProj or Microsoft Project can prove to be extremely beneficial tools. Helping this student to develop coping mechanisms when things don’t go as planned is one of the greatest gifts you can give your extroverted thinker. Kidzmet® recommends layering your child’s Multiple Intelligence preferences to help take your child’s feelings of frustration, anger or fear to a more joyful, peaceful place.